It’s finally beginning to feel more like spring! Unfortunately, when the weather heats up and outdoor activity increases, so do tick bites. In fact, risk of being bitten by an infected tick is highest in the spring and summer. Ticks may carry and transmit dangerous diseases. The Virginia Department of Health reports that ticks in VA can transmit Lyme disease, Rocky Mountain Spotted Fever and others. In order to protect you and your family, it is wise to educate yourself on what you can do to protect yourself from ticks, how to control ticks in your yard and prevent ticks from ruining your outdoor activities. Keep your grass short. 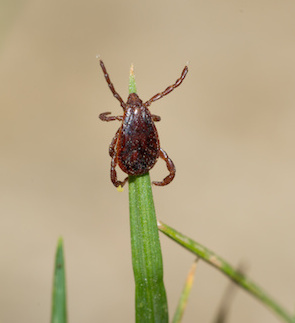 Ticks love to settle on high grasses and weeds so that they can snag a ride with a passer-by. Keeping your grass short prevents their ability to brush against you and your pets. Keep shady spots and piles of leaves away from your home. Ticks love cool, shaded environments. If your yard is shady, consider thinning out the trees and shrubs to allow more sunlight. Wear light colored clothes and cover up your legs. If you have to walk through high grasses, make it easier to spot ticks by wearing light colored clothes. Tuck your pants into your socks (not the coolest look, I know). Ticks move pretty slowly, so a periodic review of your legs should help you spot them in plenty of time. Try to stick to cleared trails. The less brush rubbing against you, the better. To DEET or not to DEET? Studies suggest that 20% DEET will prevent ticks best. However, those with chemical concerns regarding DEET may prefer a natural pest repellant such as those which contain rosemary and eucalyptus oils. Apply tick control products to your cats and dogs. Even if you think your pets are indoor pets, you’d be surprised. If your pet goes out into the yard to do its business and immediately comes back to the house, there is still a chance that ticks may be encountered. Regular self-checks. Get into the habit of performing self-checks for ticks when you’re outdoors, prior to entering your home and each night before bed as needed. Check your body’s hot spots, especially: arm pits, behind the knees, up under your hair, behind your ears! Consult with a professional. We can offer you the added expertise and services needed to help you create a yard that is off limits to ticks. At Alexandria Pest Services, we are committed to offering you the best technicians in the business and the latest techniques that are advanced and highly effective against ticks. Call Alexandria Pest Services at 703-923-0925 to schedule a professional evaluation. We can help you get rid of these invaders in your yard!